This book is on sale on Amazon for $1.99 (regularly $8.25) 9/17/2017 - 9/24/2017! This is a romantic story about unintended consequences, the art of being rescued and the power of love making a choice we may have never made for ourselves. Yakiesha's fiancée was murdered while working on some invention she knows nothing about. At the corporate Christmas party, Yakiesha has a simple and innocent plan to warn the next man of the danger that awaits him. In the crowded room, hundreds of employees have gathered before the holidays. It was a simple kiss that might make two people appear that they were casual lovers with no concerns other than what the holidays might bring. A small thing to throw off any corporate spies who might be watching them. That kiss forever changed Yakiesha’s life and ended any thought of retreat from the danger that awaited them. Forces that she could not understand, plunge Yakiesha and Marty into an odyssey leading through danger, in a landscape inhabited by uncertainty and new things a couple never had to deal with before. 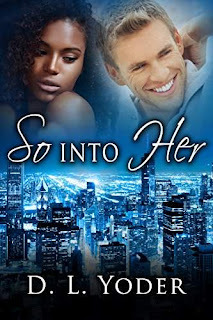 So Into Her is a romantic adventure that has elements of science fiction, suspense and drama woven into an inspiration tale that is sometimes funny, sometimes heart-touching but always entertaining. So Into Her showcases how one woman’s love can be the saving force in a man’s life.